SEOUL, South Korea — North Korea’s top diplomat accused the United States of failing to live up to President Trump’s agreement with its leader, Kim Jong-un, warning on Saturday that the country would not start denuclearizing unless Washington took reciprocal actions. Speaking at a closed-door session at a regional security forum in Singapore, Ri Yong-ho, North Korea’s foreign minister, said his country had taken a series of actions toward denuclearization, such as halting nuclear and missile tests, demolishing an underground nuclear test site and dismantling a missile engine test site. But Mr. Ri said that Washington was dragging its feet in taking corresponding measures to build mutual confidence and improve ties with Pyongyang. Such steps, Mr. Ri said, include easing sanctions and declaring an end to the 1950-53 Korean War as a prelude to negotiating a formal peace treaty to replace the armistice that halted the war 65 years ago. “However, the United States, instead of responding to these measures, is raising its voice louder for maintaining the sanctions against the D.P.R.K. and showing the attitude to retreat even from declaring the end of the war — a very basic and primary step for providing peace on the Korean Peninsula,” Mr. Ri said, according to an English transcript of his speech, acquired by the South Korean news agency Yonhap. He used an acronym for the Democratic People’s Republic of Korea, the North’s official name. Mr. Ri reiterated North Korea’s longstanding demand that both the United States and North Korea should take “simultaneous actions and phased steps” toward denuclearizing the Korean Peninsula while simultaneously improving bilateral relations. But frustration has since mounted on both sides, as each accused the other of not living up to the Singapore agreement. North Korea accused the Trump administration of making a “unilateral and gangster-like demand for denuclearization” after Secretary of State Mike Pompeo visited Pyongyang, the North Korean capital, last month to urge the country to take more steps like handing over an inventory of its nuclear weapons and facilities and dismantling some of them. 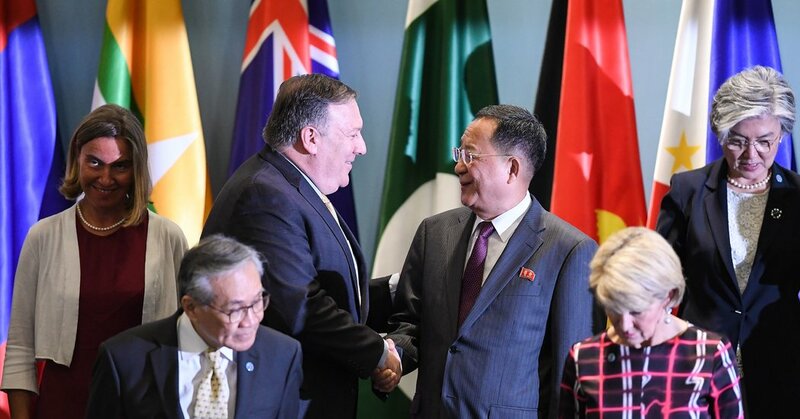 Mr. Pompeo, who also attended the same security forum, shook hands and chatted briefly with Mr. Ri when participants gathered for a group photo, but he was not present when Mr. Ri made his statement. An American diplomat later handed Mr. Ri a letter from Mr. Trump to Mr. Kim. Mr. Trump received a letter from Mr. Kim this past week. It remained unclear what Mr. Trump and Mr. Kim discussed through their correspondence. Speaking in a news conference, Mr. Pompeo stressed the importance of keeping economic and diplomatic pressure on North Korea. But his appeal came as reports emerged indicating that sanctions against North Korea were not being enforced as effectively as the United States hoped for. A confidential United Nations report, leaked to the media over the weekend, said that North Korea was continuing with both its nuclear and missile programs. The report said it had increased illegal ship-to-ship transfers of oil products at sea to evade sanctions and enlisted a Syrian arms broker to sell weapons to Yemen and Libya. Mr. Pompeo is now in Jakarta, Indonesia, where he is scheduled to meet on Sunday with President Joko Widodo. Richard C. Paddock contributed reporting from Singapore, and Gardiner Harris from Washington. Charges, deal, Envoy, Holding, isn't, Korean, North, Nuclear, U.S.